Isaac Rosenberg was born in Bristol in 1890 and raised in great poverty in Whitechapel. Despite an early talent for drawing and writing, by the age of fourteen he was unhappily apprenticed to a firm of Fleet Street engravers. He took evening art classes at Birkbeck College, where he won many prizes, before following Mark Gertler and David Bomberg to the Slade School of Art (1911 – 14). Afterwards Rosenberg visited his sister in South Africa where he painted, wrote and lectured about art, before returning to England in 1915. After enlisting in the army in October 1915, he was sent to the Front in 1916 and was killed, aged 27, while on patrol on 1st April 1918. Despite publishing only two short collections of poetry during his lifetime, Rosenberg is now regarded as one of the finest War Poets of his generation. The exhibition, 'Whitechapel at War: Isaac Rosenberg and his Circle' (Ben Uri, 2008), was the first to examine his art in the context of his Whitechapel peers. 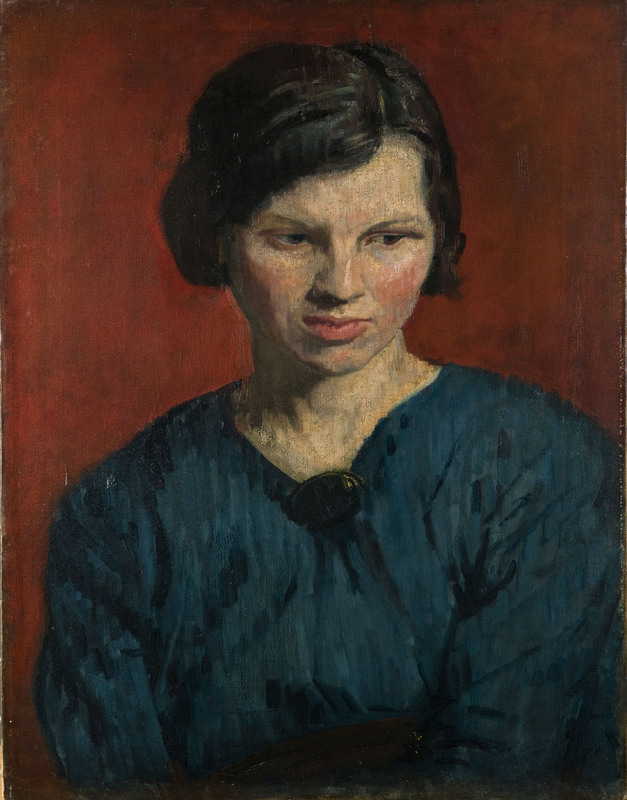 Rosenberg’s portrait of Sonia Cohen, a former sweatshop worker and aspiring actress with whom he was in love, was painted during several sittings in May 1915 when Rosenberg transformed Sonia, then pregnant with her first child by fellow 'Whitechapel Boy', John Rodker, into a Whitechapel madonna. Rosenberg references Leonardo da Vinci’s The Virgin of the Rocks, where the Virgin wears a cloak of a similar blue, also fastened at the neck with a black brooch, and wrote to his patron Edward Marsh that he had ‘[…] done a lovely picture I’d like you to see. It’s a girl who sat for Da Vinci, and hasn’t changed a hair, since, in a deep blue gown against a dull crimson ground'. 'Portrait of Sonia' skilfully blends these references with more modern techniques. Rosenberg's paint handling is characterised by the strong, broad, vertical brushstrokes that dominate his portraits in this period, and he also employs a vivid crimson background reminiscent of Alfred Wolmark’s colourist work. The portrait shares both this background and treatment with Rosenberg's portrait of Clare Winsten (Clara Birnberg) (UCL), who married Whitechapel writer Stephen Winsten, probably painted in the same year, but with clearly a greater emotional distance between the artist and his subject than in his tender portrait of Sonia.